In the midst of winter, with its quiet-cold and peaceful nights, it is a good time to focus on the "hard problems". The ones where the engineering requires absorbing all the various facets of a design into ones mind and then a deep consideration from many angles before finally proceeding. In these days of deep software stacks, sometimes the proverb above requires measuring much more than twice. One begins to feel like an artisan of a guild, in an era long passed. It is a good feeling mostly. With that said, a user on the Reddit forum rightly called me out last week for never updating the blog. Time sure moves fast when you are deep in the software. It is good to be reminded to come up for air, at least so often that the poor social media does not wither away on the vine. Thus, this post today. I am pleased to report that the next update, likely called 2.7, is getting very close to release [Update: This was released on March 9th]. There have also been quite a few new versions out since the last blog post so if you are not already running version 2.6.5.2 from this last September, be sure to pick it up. You can expect this new release hot off the compiler in the next few weeks. Lastly, in other news, Microsoft has listed SteadyMouse on their Accessibility Resources page for 2019. SteadyMouse is honored to be featured as an aid for "Dexterity and Mobility". It's been a busy last few weeks, with some much needed updates to the front-end of the website, and basic marketing campaigns finally underway. I am beginning to integrate more accessibility features into the site and most of the social media accounts are somewhat synced up now in terms of look. Getting the word out is hard, however I am pleased to say that a short clip showing off SteadyMouse 2.3.2.0 in action got a lot of attention from Twitter over the past week. When you see likes coming in from doctors, folks at Microsoft, and a past CTO of HHS it's sort of an aw-shucks grin moment. Seeing knowledge of the software get out there and brighten a few people's lives feels pretty good. I also get the feeling, from how excited some of the docs got, that it's pretty hard not always having something to offer a patient. Even if it's not exactly a medicine to be prescribed, I hope SteadyMouse will be able to help them out with some of those cases. On the aesthetics front, I'm happy to finally have some of Nicole Blackburn's great artwork integrated into the site at last. The cover image next to the logo was made by her back in November, along with the mouse at the top of the About page. The site's menu has been revamped as well with the help of Font Awesome, which is living up to its name so far. Over in SteadyMouse code-base land there is a new feature in development that I'm rather excited about. I expect the artists and photographers out there are going to especially appreciate this one because it allows for significant precision. No more hints than that, however there's a small chance it will make the cut for SteadyMouse 2. If not, then SteadyMouse 3 for sure. Finally, a special shout out of thanks to the folks at the National Tremor Foundation in the UK for reaching out to team up, and for writing about SteadyMouse this last week. Feel free to check them out. Years in the making and it's here now! Today I'm releasing SteadyMouse 2 to the world, and especially to all of you who asked over the years and patiently waited. I've put everything into this for you, and I know it's going to get many of you back on track. I can't wait for that part. Special thanks as well to my grandfather, Dr. James Gottemoller who started it all. This one's especially for you! 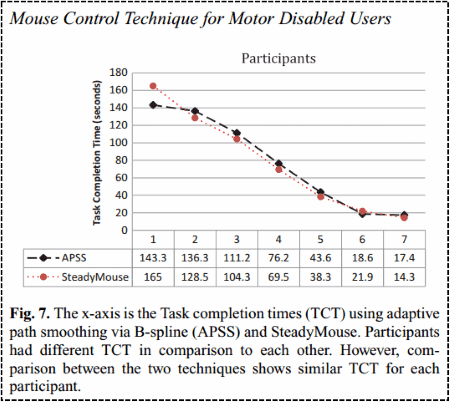 I recently learned that the old SteadyMouse v1.3 was featured in back-to-back trials in a publication to RESNA's Assistive Technology journal! It's amazing to see what has happened with SteadyMouse just by placing it on the Internet. I had no idea this even was occurring at the time! There's lots of fascinating data such as user cursor motion under various conditions and "Task Completion Times". Apparently SteadyMouse was up against an Adaptive Path B-Spline algorithm of some kind. Fun stuff and, from the pub's conclusion, it looks like the B-Spline method barely edged me out! I'd love to see a rematch with SteadyMouse 2! You all deserve a status update! The paid version of SteadyMouse is getting close. My ballpark guess is sometime in the next four months. The list of internal improvements alone is getting pretty large and I'm really excited to eventually share all the details with you. Everyone has been amazingly patient waiting for this overhaul. As a glimpse of things to come: Multi-monitor support is perfect now. The on/off toggle key(s) are configurable. Filtering is going to allow even more aggressive levels. The visual-effects system will be beautiful and it will be smooth. From testing so far I know Windows 10 down to Windows XP will all work fine! Multilingual support will happen in a version or two. This is all off the top of my head. Eventually I'll post the full change log for those who love details. There are so many changes. I wish I could show off the internal architecture improvements. The internal design is finally clean, efficient, and elegant. SteadyMouse is ten years old this year! It has held up pretty well but an upgrade is needed. I'm also sure many of you would appreciate a few long-standing issues getting fixed. I want to do this and I know I can make it beautiful. Nevertheless, it's going to take me a lot of time and effort to bring the software into the current decade. As a compromise, the new version will have to cost something. When SteadyMouse is ready I will send you the news. Just leave me your email using the form below. In short, if there's enough demand, then it will be a joy to make this happen for you. Also, the old versions of SteadyMouse from 2006 will always remain free so no need to worry. Several years have gone by since a new version of SteadyMouse was last released, and you may be wondering what the status of the project is. The answer is that while I have not gotten around to making further updates, version 1.3 is still working very well. Windows 7 (32-bit & 64-bit) as well as Windows Vista are supported in addition to XP, 2000 & NT. Also know that I do have a bug list I'm maintaining, so any emails you've sent me regarding issues have not been lost. I hope to get to this someday, but have not found the time as of yet. Thankfully this list has remained pretty short, with only 11 items at the present time (mostly low impact). I appreciate all the emails from everyone who has found SteadyMouse to be an improvement to the heavy burden that they carry. These have been a great blessing to me and I am glad to have played a part in your lives. God willing, I will keep the site running for many more years so don't worry too much about SteadyMouse going away. In the mean time I will continue to try answering your emails in a timely manner. SteadyMouse v1.3 is available for download! There are changes all across the board this time around. Most notably (with nearly as much code as all of v1.2) the new "Icon Targeting" system is in place and has gone through several rounds of testing. It takes some getting used to, but I think it's safe for me to promise that you'll smile the first time you see it activate :) As for everything else... I have absolutely lost track of all the changes, so rather than presenting you with a list, I'm giving you the go ahead to explore :) Don't worry, you won't break it (easily :P). Feel free to let me know what you think. SteadyMouse is built on feedback. I want to give a quick update on the status of things. Version 1.3 should be ready in the next two weeks. I'm fairly excited about the main feature in this release as it might even be useful to people without essential tremor. There's going to be sort of an an "Icon Targeting" system to help the user quickly home in on the item he wants to click. It auto detects the nearest icon in the window the cursor is over, and snaps the cursor to it with the press of a special key. I'm experimenting with a few other options that don't require a special key as well, but those are still a ways off. Check back in a bit. Hi there! This is the first public release of SteadyMouse. The reason it's starting at v1.1 is because there were about five prior versions that got tested on a (very patient) Grandparent. Hopefully this means most of the kinks are worked out by now, but if you do happen across something that isn't right I'd love to hear from you. Use ben-essential-tremor-filtering@steadymouse.com for comments, bugs, questions, and anything else. As of yet the system has only been tested on Windows 2000, and XP so if you run 95, 98, Me, or NT, and it totally doesn't work send me an email so I know about it.